A jury has watched CCTV footage of police attempting to resuscitate a man who had been hit by a patrol car. 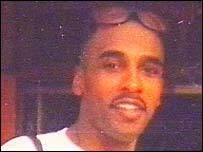 Michael Powell, 38, died in September 2003 after he was detained following a disturbance at his home in Birmingham. Ten officers from the West Midlands force deny charges connected with his death at Leicester Crown Court. The tape recorded officers discussing his worsening condition and saying that they thought they were in trouble. One is heard urging: "Michael, come on". Police were called to Mr Powell's home in Wilton Street, Lozells, Birmingham, after he smashed a window in the early hours of the morning. Pcs Tim Lewis and David Hadley, who were the first to arrive, drove their car into the father-of-three, the court heard. The officers later claimed they thought he was armed with a gun. Mr Powell, who suffered from mental instability, was sprayed with CS spray and struck with a baton before more officers arrived and restrained him. He was then taken to Thornhill Road police station where a CCTV camera recorded the moment he was taken, unconscious, into custody. Courtenay Griffiths QC, prosecuting, said: "The Crown submit that the officers' conversations recorded on CCTV footage establish that they were aware of the severity of Mr Powell's condition at an early stage." Other taped comments played to the jury included "Delirium, excited delirium gone real bad" and "He tensed up three or four times in the van". Somebody asks if Mr Powell was asleep. "Dream on," came the reply. The court was told on Wednesday that Mr Powell's mother had called 999 at 0032 BST and by 0157 BST he was dead.